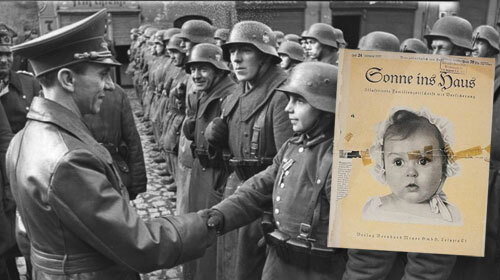 Nazi Joseph Goebbels (left) addressing German troops and the cover of magazine picturing the Jewish baby he chose as the poster child for the Aryan race. In a bizarre twist the poster child for Nazi Germany’s “Perfect Aryan Baby” during World War II was actually Jewish. The Nazis believed Aryans were the superior race and considered other groups such as the Jews, as sub-human. The Nazis used the photo to promote its supremest race agenda. Hessy Taft was just six months old in 1935, when her mother, Pauline Levinsons, took her to a famous German photographer Hans Ballin for a baby photo. Unknown to the family, Ballin later submitted Taft’s photo to a contest initiated by the Nazi party to find the perfect Aryan baby. It appears that Joseph Goebbels, the Nazi party’s propaganda minister, chose Hessy’s photo as the winning picture. The photo would later appear on posters, post cards and other Nazi propaganda materials. Goebbels led the Nazi’s propaganda war against the Jews paving the way for their plan to exterminate the Jews. A few months later, Taft’s mother became aware the Nazis had chosen her photo when she saw it on the cover of a magazine. However, other than talking to the photographer about what happened, they remained secretive because of their Jewish background. The Nazis never did find out they gave the Aryan award to a Jewish girl. Hessy Taft, 80, who is now a professor of Chemistry in New York said if the Germans had found out about her Jewish heritage, they would have sent her to the gas chambers. Photo of Jewish synagogue burnt during the Night of Broken Glass. There are some similarities between what happened with the Nazis and the Book of Esther. I believe Satanic forces were at work in both instances to exterminate the Jews. When the Adolf Hitler came to power in Germany, there were nine million Jews living in Europe and the Nazis killed about six million of them mainly through gas chambers in their concentration camps. Esther became Queen to the Persian King Ahasuerus after his wife fell out of favor. The Jews were in captivity at the time because of their sin. Similar to Taft, Esther’s Jewish heritage was kept hidden. It allowed her to play a key role in preventing a mass genocide of Jews in that country. Haman, a senior bureaucrat in the Persian government, planned a one day attack on Jews throughout the Persian empire to exterminate the Jews and seize their assets (Esther 3:12-14). Fortunately, in this instance Esther was able to stop the genocide. In Nazi Germany, a similar one day attack was carried out against the Jews, but this time successfully. It took place on the night of November 9-10, 1935. It involved simultaneous mass attacks against the Jews across Austria and Germany by the Nazi’s SA military and supporters. The Nazis called it Kristallnacht, the Night of the Broken Glass, because of the shards of glass littering the streets after the attacks. Jewish synagogues, homes, businesses and even hospitals and schools were destroyed. 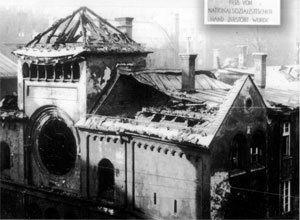 It is estimated 1,000 synagogues were burnt and 300,000 Jews sent to concentration camps. In many ways, this was the official start of the Nazi war against the Jews. I do not believe these two attacks against the Jews centuries apart were a coincidence. The similarity of the two plans reveal a common denominator — dark forces were at work behind the scenes in both these nations. Many in the meeting understood this as an order to organize an attack against the Jews. This was the same Goebbels who chose a young Jewish girl as the poster child to represent the perfect Aryan race. Nazi poster girl who declared the ideal Aryan baby in propaganda material is revealed to have been Jewish: Daily Mail. Previous PostDoes the rebuilding of a temple in Jerusalem hinge on a red heifer?